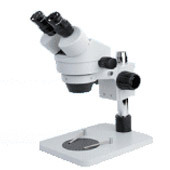 The NV zoom microscope offers users perfect performance at an affordable price. 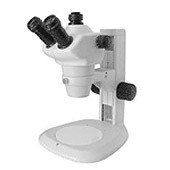 These advanced-design zoom microscopes have the premium-grade features and image quality that you would expect from our product, including a wide field-of-view and a long working distance, a protective body glass to shield the instrument from dust particles, and both fluorescent and halogen lamps for both transmitted and reflected illumination. Mechanical design is simple yet durable for daily operation in industrial, laboratorial, and educational environments. Optical system of Seek's ’ SKZ 0745 Zoom Stereo microscope is newly, Fully coated optical system sharp and clear images with extremely good flatness an contrast. The images are brighter and more distinct even as the periphery of the field of view. With their large zoom range and long-working distance, These are ideal for high-magnification, high-resolution observation in precision-oriented semiconductor and other industries. Zoom objective magnification 0.7X~4.5X, working distance 118mm. 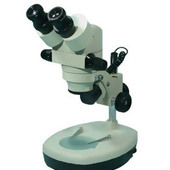 SKS0745 series zoom stereo microscopes have two types, SKS0745(binocular) and SKS0745T(trinocular). It is characterized by brand-new optical design, the best reproduction and true color image. It has many optional stands and attachments. It can be applied in modern biology research, semiconductor and the other science and technology industry field. 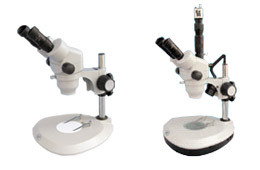 SKS series zoom stereo microscopes have three types, SKS1065(binocular) and SKS1065T(trinocular). It is characterized by unique optical design, large depth and width of visual fields, long working distance. It has many optional stands and attachments. It can be applied in modern biology research, semiconductor and the other science and technology industry field. SKS1065C zoom stereo microscope with built-in coaxial illumination for observation micro-surface in integrated circuit, metal parts, semiconductor etc.